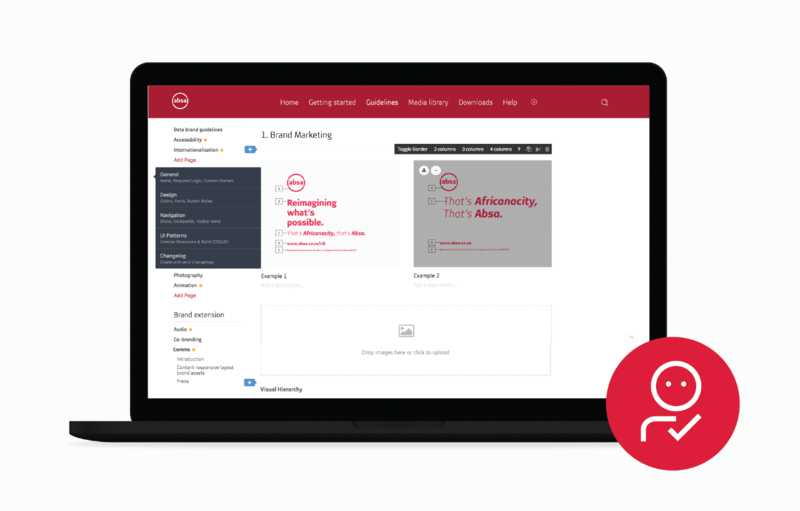 Scalable brand management software hadn’t really been used in South Africa before now, so when Praekelt designed and built a brand site for Absa Bank, it wasn’t just a new era for them, it was a new era for branding. There was a time when the internet was not a thing. It was a simpler time, when we didn’t carry the world in our pockets. We looked people in the eye, read magazines in waiting rooms and amused ourselves with our own pets. It was a simpler time but it wasn’t an easier time, especially for brands. You weren’t always able to design a website in a day, and the halftime Super Bowl ad was the best you could hope for. Brands were more steady, rigid, and static. They carved their Corporate Identities into stone tablets. Stone tablets became black and white logo printouts, and CI PDFs with seventeen different versions. But that was a time when the internet was not a thing. It is now, obviously. So the wizards over at Frontify came up with a way for brands to share their CI’s on real tablets, desktop computers and pretty much anything else with a digital pulse. They’ve given a new identity to corporate identity. They call it scalable brand management software, we call it genius. In fact, we think it’s so bloody clever, we’ve become an official partner for the Middle East and Africa, where this kind of thing hasn’t been done. With their system, and our team of UX Designers, Developers, and Product Support, it’s a match made in a very happy place. We liked it, so we put a ring on it. With the new-found ability to build online Style Guides, Brand Portals, Pattern Libraries, and Workspaces, all we needed was a brand. And we found one – we found a big one. 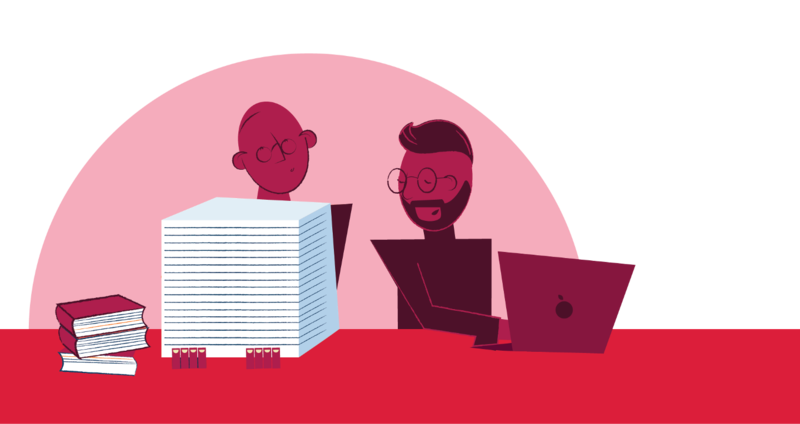 Our first project working with Frontify was a classified, red-stamp-on-the-brief, top-secret mission from day one, yet all we’ve ever wanted to do was shout it from the rooftops. But we signed an NDA and we didn’t want anyone to get arrested – or worse, fired. We were briefed to design and develop an online brand management tool for one of South Africa’s super-brands, who were relaunching their look and needed a digital space to keep their new guidelines and assets. With hundreds – often thousands – of people responsible for their marketing and advertising, every brand custodian (mind the buzzword) needs to be on the same webpage. And that’s where we come in. Absa relaunched their brand this week with a new logo, new look and a comprehensive, digital set of guidelines and resources to usher in a new era. But it’s not just a new era for Absa. This quote has been used by many people, many times, because it rings so true for so many brands, especially in today’s fast-changing digital world. With any luck, a brand’s story will never end, it will just be told by different people. But those people need a consistent base to work off. Brands got away with printed CI manuals back in the golden age of advertising, when Mad Men was more than just a series, and the Don Drapers of the world smoked Stuyvesant at their desks and did one ad a year. We used to be able to approve every advertisement and control how people portrayed brands. But it’s a new world, and we can’t do things the old way. Innovation waits for nobody – the world changes fast and brands that don’t change with it get left behind eating dust and irrelevance. Brands live, breath and change. They run and then they rest. They move, they shake. They evolve. Frontify allows brands to always be ready for that revolution, delivering a constantly-updated resource library to different types of users. The Viewers - the everyday creatives who need access to the files, folders, and how-tos. The Editors - the team of creatives and leaders who manage the brand and approve the quality and consistency of what is produced. The Owners - the super users who can do just about anything on the site and always have an overview of what’s happening at any given time. Luckily we’re used to working with lots of different people in lots of different roles. One of our core values at Praekelt is co-creation, and this project made us put our money where our mouths are. The job required a gargantuan amount of coordination from our production team, and collaboration with four major stakeholders: Grid Worldwide, who designed the new brand, Frontify developing the brand management tool, the Absa Design Office and the Absa Brand Team. We had clients to the left of us, stakeholders to the right and there we were, stuck in the middle with a deadline. We ventured into new territories, challenged ourselves every day and flexed muscles that we didn’t even know we had. Although we got some special favors from Frontify thanks to our partnership, there were still some things that stood in the way. 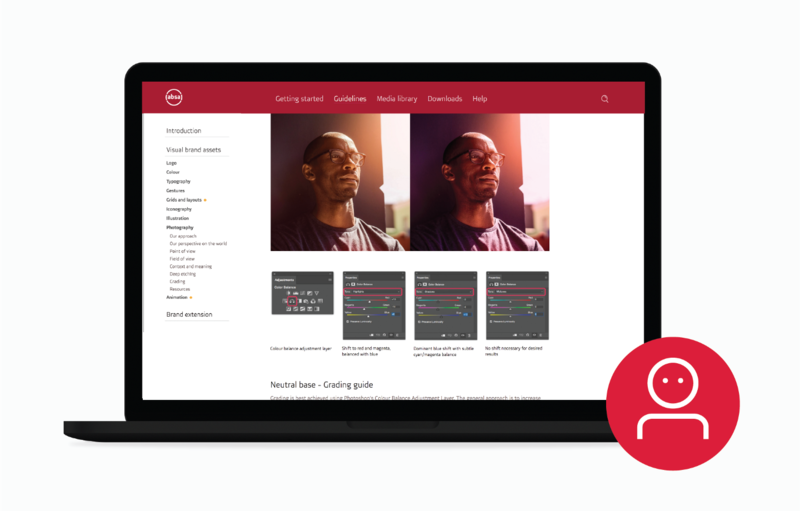 This was a really interesting design challenge: we needed to stay true to the new Absa brand, while designing in Frontify’s existing front-end interface. So the process involved a lot of design work that wasn’t necessarily visual. Our collaboration involved collective decision-making, conversations, and brainstorms for brand storms. It almost required us to throw the traditional creative process out the window. But we couldn’t do that, because we signed an NDA and it might’ve landed on someone’s head. So we put on our big person pants and innovated until we were Absa red in the face. The lead designer on the job, Josh Pretorius, was forced to challenge his designerness throughout this project. It is quite strange – designing for designers is pretty terrifying. It’s like writing a song for Bob Dylan or painting Salvador Dali a picture for his birthday. 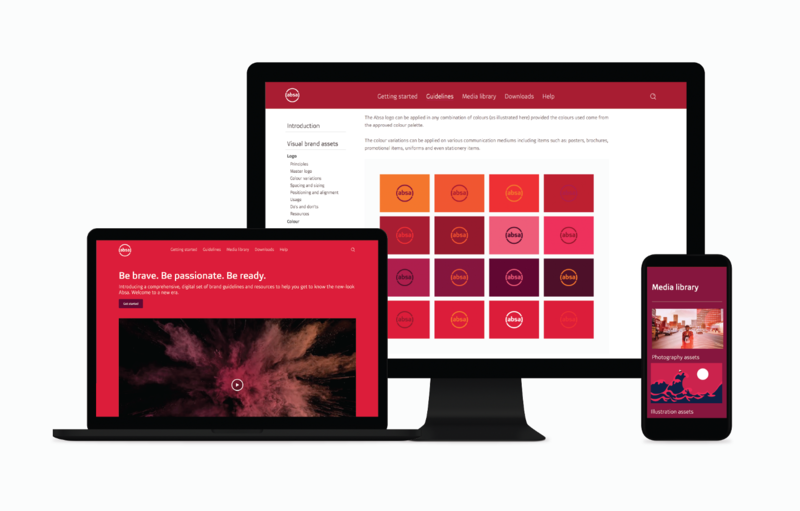 But after all was said and done, our magic makers managed to make magic, and Absa’s brand site has everything from logo sizes and color usage to UI patterns and payoff lines. Our brand site number one is done, dusted and downright damn incredible. This article was written and published by one of our agency partners, Praekelt, connecting the next two billion people to digital products. Learn more about how your agency can become a branding thought-leader as well, by partnering up with Frontify.